Inspired by the popular wrap shoes seen from brands like TOMS ® and BOBS ® Alpargata style shoes are all the rage! This PDF pattern, designed to fit 13-14 inch dolls like Hearts for Hearts and Corolle Les Cheries, is designed to use woven cotton fabrics, works with stripes, florals, polka dots, thin corduroy and much more. Note: This pattern DOES NOT fit 18" American Girl Dolls. If you are interested in that size shoe click here. I used a stiff pellon fusible instead of cardboard and hand stitched a satin cloth sole to the bottom so that the ballet slippers would be washable. 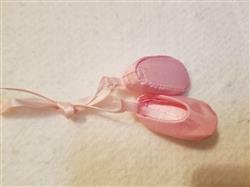 They were ballet slippers to go with leotards and tutus for hospitalized kids with compromised immune systems and had to be washed prior to gifting. I'm sure I'll use the pattern will be used in many ways. I was just looking at this and saw that the shoes are for 13-14 inch dolls....I was wanting for 18" dolls.....will these fit the 18" or do I need another pattern for that?